These homemade milk chocolate made with 5 ingredients plus a lot of love are a great gift for any occasion. It is one of the easiest homemade chocolate recipes with basic ingredients like milk powder, cocoa, butter, brown sugar, and water. Things that you would normally have at home. We made a huge batch of these in our school kitchen for the first Karma Kitchen in Bucharest. They were an instant hit even before we finished them. 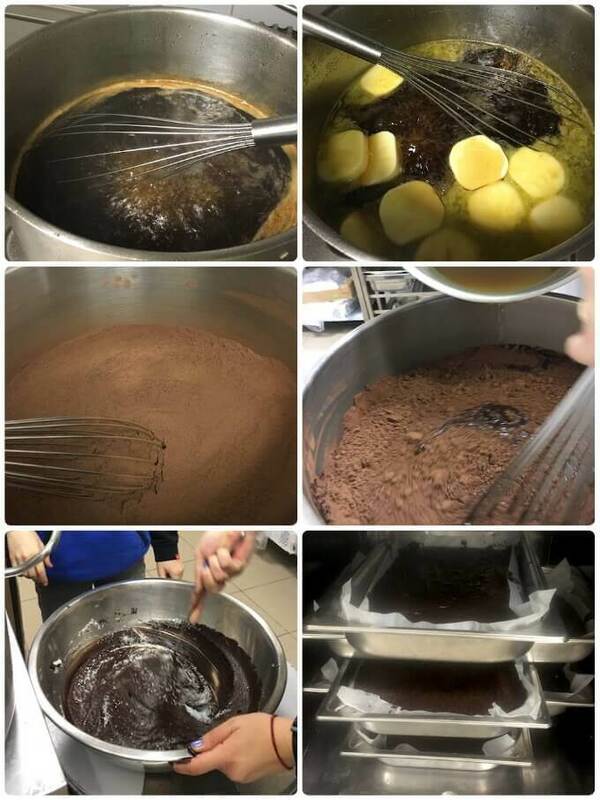 The chocolates were made to set a day before, during school hours, and the kids who were helping in other preps came in all the time to taste and after the first taste, they just kept finding reasons to come back into the kitchen. We made three type of chocolates for the dessert platter – Plain chocolates, Walnut chocolates, raisin chocolates, and coconut chocolates. In this post, I’m sharing the recipe for homemade chocolates with coconut. We got two types of desiccated coconut powders — a simple one to put inside the chocolate and another one with a little pink food coloring to sprinkle on top. I would ideally stay away from any sort of food coloring, but here I lost on popular vote :-). But it is completely optional to use colored desiccated coconut. But doesn’t this chocolate look straight out of a fairy tale with the pink coconut? The recipe is simple, just boil, mix, spread and leave to settle. Ramadan has started and I’m planning to make another big batch of these homemade chocolates to gift for Iftar. If you like this recipe, please take a moment to rate it and/or leave your comments at the end of the blog. It will really encourage me to keep exploring, learning and improving. Easy homemade chocolate recipe with just 5 ingredients and lots of love. In these, I used desiccated coconut for flavoring, but you can choose any flavors from plain chocolate to different nuts or fresh fruit peels! They are also perfect as gifts for any occasion. Place water and sugar in a big pot. Put on medium-high heat and boil till the syrup is thick. Usually 15 mins. In a separate bowl, sift together milk powder and cocoa and keep aside. Once the sugar syrup is thick, add butter to it and mix well till the butter melts. Slowly add the butter and sugar syrup wet mixture to the milk and cacao dry ingredient. Mix it really well till everything is well incorporated. At this point add any other flavoring you may like desiccated coconut or chopped walnuts, raisins, almonds etc. Line a baking tray with cling film (makes it easier to remove the chocolate after it has set). Pour over the chocolate mixture. In case of coconut chocolate, sprinkle some more desiccated coconut on top of the chocolate and press it down softly into the mixture. Set in fridge for at least 8-10 hours. Dip a knife in hot water and smoothly cut through the set chocolate. Experiment with different flavors! You can add orange or lemon peels. Chopped nuts are the easiest. If you are adding chopped nuts to the mix, sprinkle some on the tray before pouring in the chocolate mix, so that you have some on the outside too. 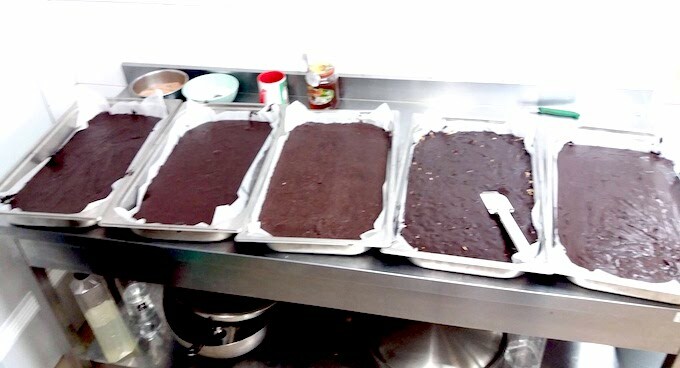 The recipe makes about 1kg of chocolate. Nutrition Info is for 100gms of chocolate. An additional last step is to lick the bowl of all residual chocolate! I love gifting homemade sweets. 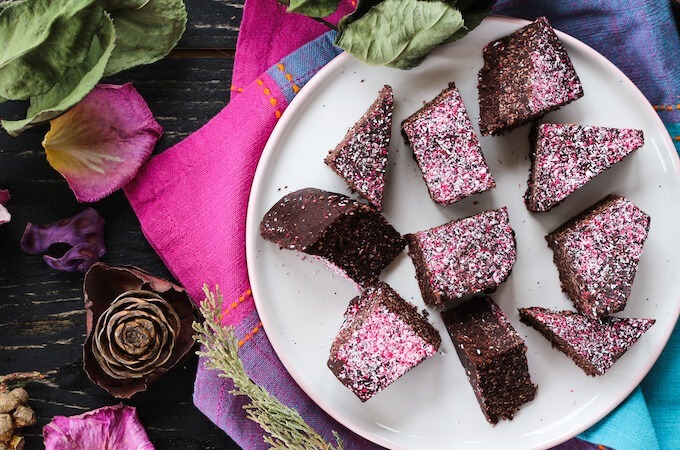 This easy homemade chocolate recipe is now in my ‘food as gifts’ idea book along with sweets like chocolate walnut brownies, and eggless banana muffins. That was really a moment when we lined up all the pans with different flavors of chocolate! Only 5 ingredients!?! This is right up my alley. I would definitely add the coconut because it is my favorite. This looks delish! Wow I’ve never tried making chocolate like this! Looks scrumptious! It comes out super gooey and tasty. And the recipe is good for making both small and big quantities! My mom would make chocolate fudge every Saturday night when I was young. This brings back those memories and it looks so delicious! awww… Thanks so much, Shelby! I really love it when food triggers childhood memories and actually, so many memories are linked with food.. the sight of it, the aroma of it, the taste of it… Doesn’t food just touch all our senses! I am so glad this recipe took you down memory lane. This looks AMAZING! Love how customizable this recipe can be. Thanks, Kelly! It truly is a super customizable one-chocolate-recipe-for-all! Add any flavors to the basic recipe and you can please them all! 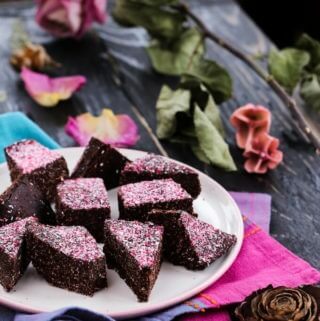 Hii Ashima.. i love the chocolates and i loved your recipe too.. i tried the recipe in my home.. everyone likes it and loved it.. especially that coconut flavor is Looks Yummy! Nice presentation skill .Thanks for the nice recipe. I tried the recipe, and it turned out dry and grainy. No way would it pour. What did I do wrong? I am so sorry… but it definitely is a pretty thick mix once everything has been mixed together. We really had to get some tough muscles in the school to mix it all together. Did you pour right after everything was mixed well and still warm? because the butter might have solidified again. You can also try again with a little more water in the sugar syrup maybe?